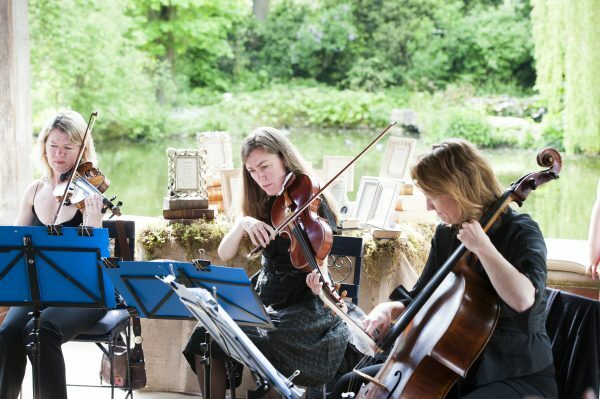 On Saturday 13th June the Manor House String Quartet played for a wedding at one of our most local and regular wedding venues, The Dairy at Waddesdon Manor. It’s always lovely when the bridal couple are enthusiastic about music and for this wedding I was asked to arrange two pieces of music especially for the ceremony. The first one was called ‘Everywhere Freesia’ by Thomas Newman and appears in the film ‘Meet Joe Black’. This piece takes its inspiration from many composers of English string music and provided atmospheric¬†music for¬†the bridal entrance music. The bride (Sarah) and her sister (Lauren)¬†are both¬†accomplished singers and it fell to Lauren to sing a special song called ‘Silent Noon’ by Ralph Vaughan Williams during the signing of the register. She sang the song beautifully. At the end of the ceremony we played the wedding party out to ‘God¬†Only Knows’ by the Beach Boys. Following a short break, we then joined everybody under one of the pavilions next to the lake. Here we performed a wide variety of different music, from Saint Saens to Sigur Ros and Louis Armstrong to James Brown! There was then a long break of around three or so hours before we re-joined everyone after the wedding breakfast had ended. We played for a further hour before the evening reception started and it was a time for the bridal couple Sarah and Leo to relax and enjoy the music on offer. It finished off a memorable day and I’d just like to wish both Sarah and Leo many years of happiness together!